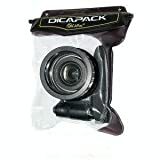 All controls are accessible – The DiCAPac WP610 Waterproof Underwater Case (Clear/Dark Brown) is a PVC vinyl housing with a polycarbonate lens made to allow a high-end digital camera to operate underwater to 16.4 (5.0 m). It can be used with a camera that has a zoom lens. It protects the camera from water, sand, dust, etc. in the ocean and mountains. The housing meets JIS IPX8 requirements for underwater usage. This case has a UP ring extension. A neck strap is included.